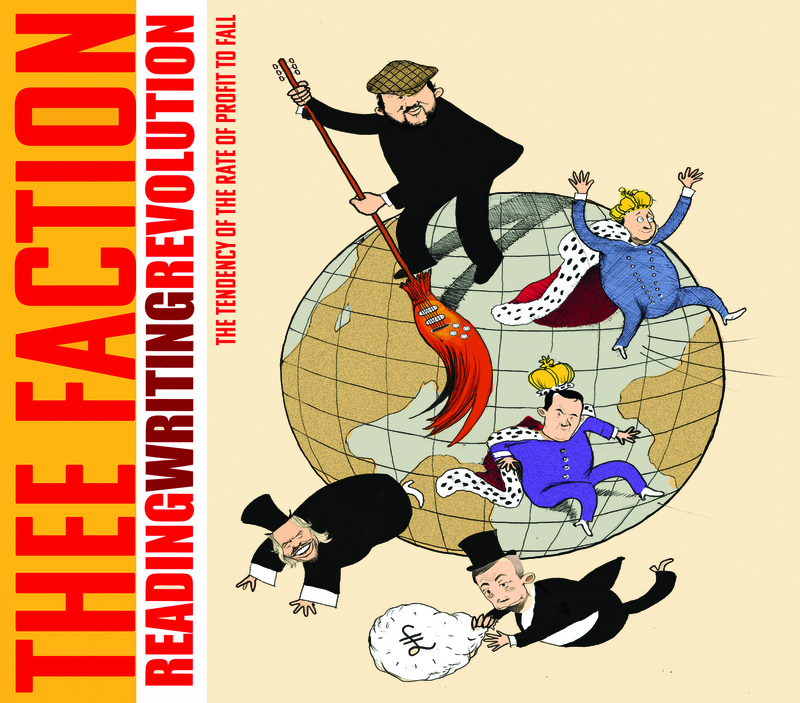 Reading Writing Revolution, or, The Tendency of the Rate of Profit to Fall, is the fifth album from legends of Socialist RnB Thee Faction. It’s yours for £7. If you are desperately trying to find the soundtrack to the fightback against neo-liberalism, and this Tory-led government. If you are desperate for solution songs, not protest songs. If you’re wondering what happened to noisy soul bands with guitars and horns. If you want a brilliant album for only £7 (incl.P&P), then look no further. 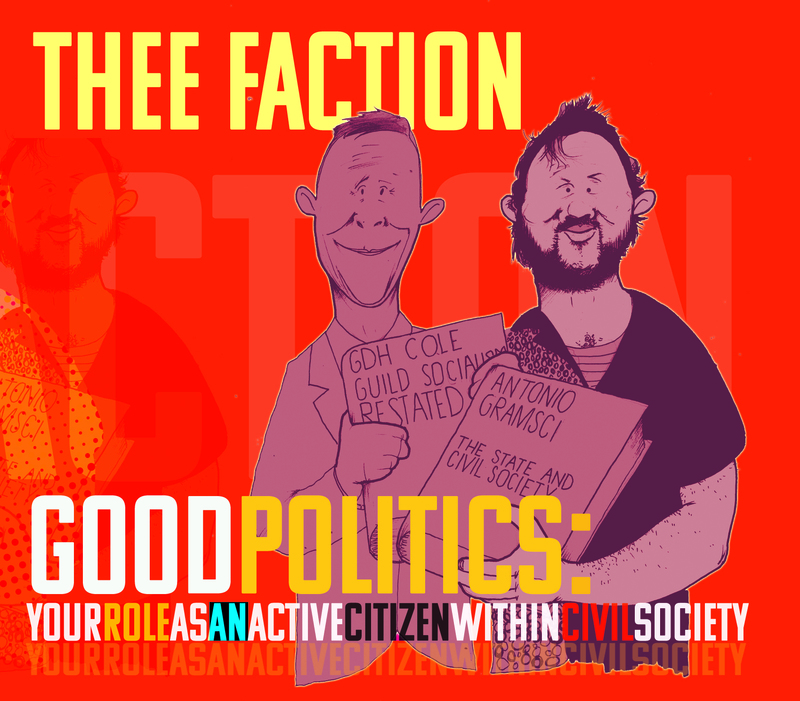 Thee Faction’s third studio album – Good Politics: Your Role As An Active Citizen in Civil Society – is out now. If you’re happy with the Mumford-isation of music, then this is not for you. But if you know, deep in your soul, that art is a hammer not a mirror, and if you need music free of ego and rammed full of devastating political analysis delivered with joy, hope and humour, you really need this record. 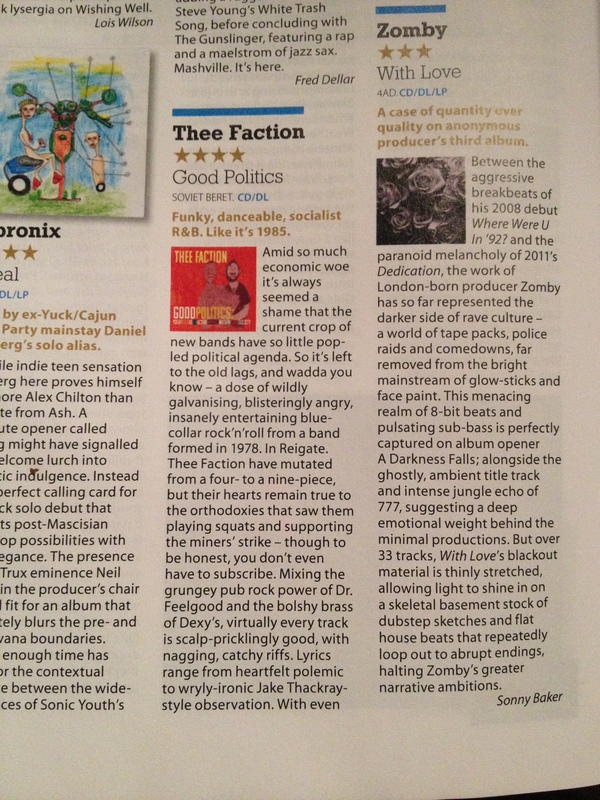 Like all those TV-advertised compilation albums in the 80s that you didn’t want, Thee Faction’s albums are not available in the shops. * Neither are they available for download. We don’t want intermediaries, and we don’t think you should have our music without the carefully considered and designed packaging that accompanies it. So you can only get it direct from us. Order right now and we’ll dispatch it within a day. 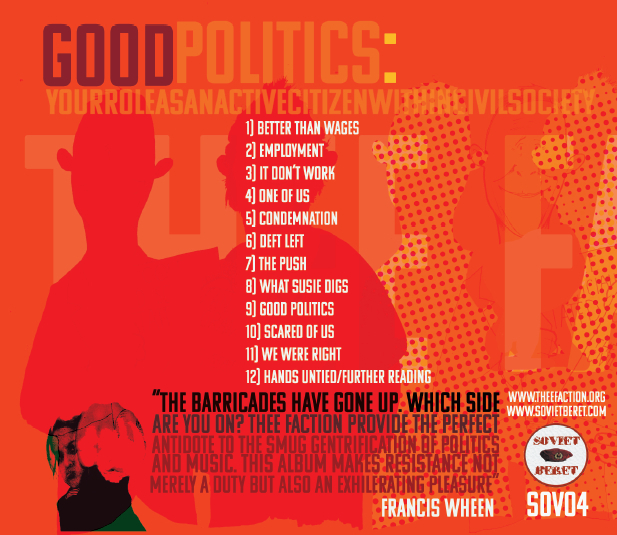 As well as live favourites ‘Better Than Wages’, ‘It Don’t Work’, ‘Employment’ and ‘Con-Dem-Nation’, the album contains some surprise treats, including ‘What Suzy Digs’, featuring our favourite living author – Francis Wheen (biographer of Karl Marx) – on tremendous lead vocals. Richard Archer out of Hard Fi pops up on vocals as usual, of course, as well as all sorts of other special guests, including the legend that is Keith TOTP. 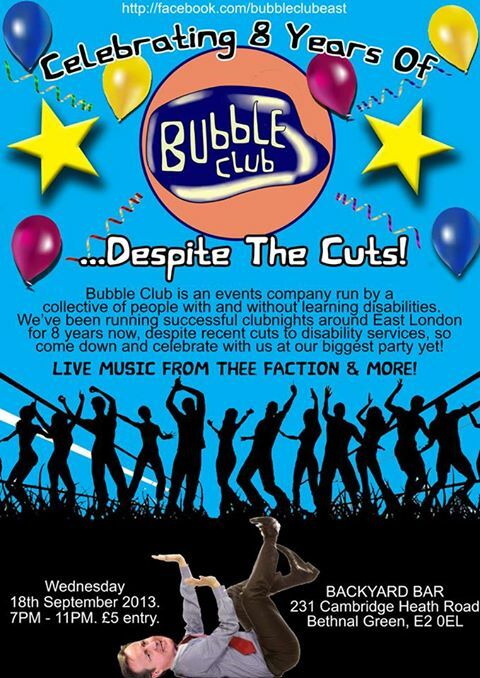 The artwork comes, yet again, courtesy of our favourite cartoonist – the Independent’s Andy Watt. So you’re getting a beautifully packaged album, full of special guests and socialist hits. For £7. Wherever you live. It’s £7. Including postage. We may even chuck in a badge. 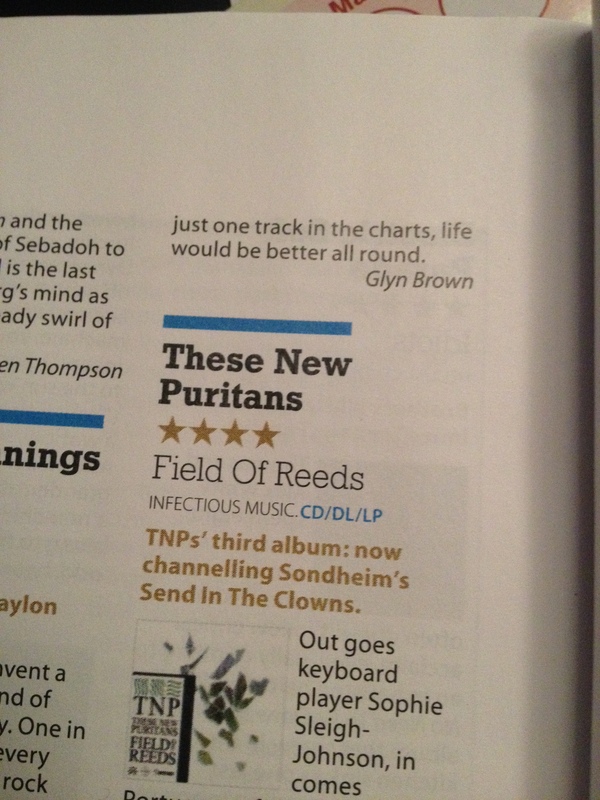 There’ll be more reviews now the record’s out, of course. But get in now. Get your copy. It’s the soundtrack to the class war. It’ll put a smile on your face and hope in your heart. And an analysis on your tongue. A socialist needs nothing else. Come on. Help a DIY band out. You may have given up buying records. Make an exception. Cos this one’s for the Movement. Order now. £7 including P&P. Click through and order. *well, bar a couple of ultra-comradely ones run by people we love and trust. We don’t know if you take Mojo. 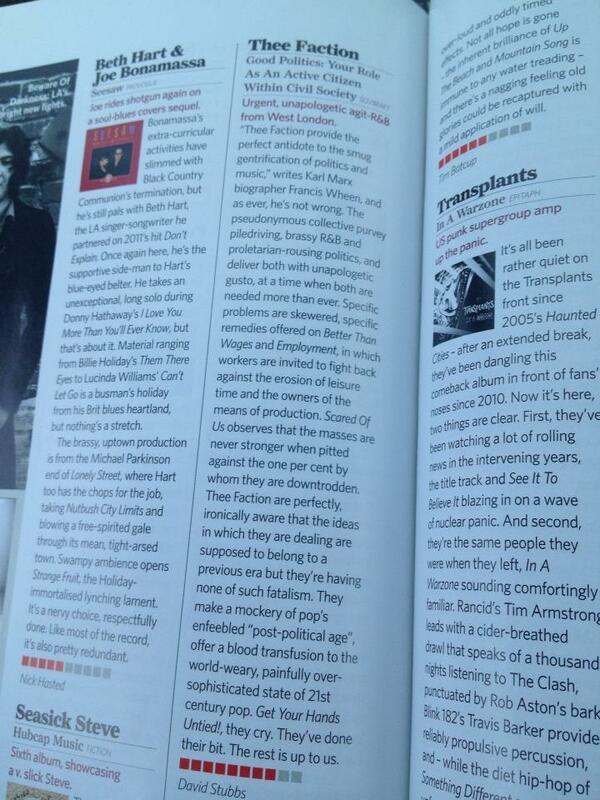 If you do, you’ll have noticed our 4 star review in there this month (August 2013 issue). If you don’t, here it is. The reviewer is absolutely right, of course. Read the review then scroll down the page for details of how to order your own copy. If you want to listen to a song or three, look for the music player over there to the right. Like the sound of it? Then click Buy Now to pick up your copy for £7 incl P&P. Act now! You know how kids today eschew the pull of RnB, ignoring their Dr Feelgood and Staple Singers records in favour of electronic dance music? Well, Thee Faction still need to reach out to them. They still need to hear our message and share our analysis. So we’ve called upon our old friend the Pylon King to take our current single – Better Than Wages – to bits and rebuilt it as a radical dance classic. He’s done us – and the class – proud. Here it is. Download it for free. And send it to the young people in your lives. Cos the kids dig this stuff. Don’t forget, Better Than Wages is just the opening track of our astonishing new album, due out on July 8th. Expect more news of how to pre-order yours next week. New single: Better Than Wages available to download on May 27th. STOP PRESS: Better Than Wages video launched at 15.00 on 8/4/13 at Artrocker TV. Check it out and share or retweet to the world. Meanwhile, you can still get Thee Faction’s first three albums as a package for £15 (3xCD 1xvinyl LP), or £7 each, direct from Soviet Beret Records. Need convincing? Here’s what the critics say.